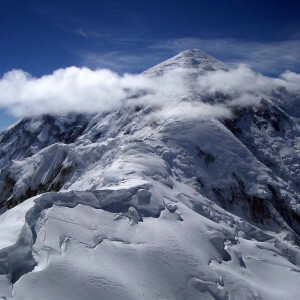 Mountain Trip led the first successful guided expedition up Mount Foraker in 1980 and we have led numerous teams up the mountain in the decades that followed. 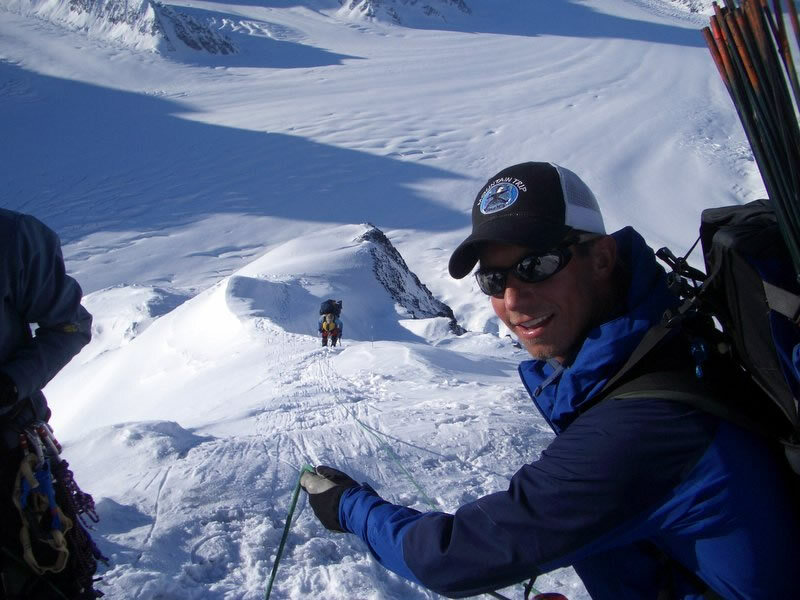 The Southeast Ridge is one of the finest alpine routes in the Alaska Range. The route involves steep snow climbing, interspersed with ice pitches and exposed, cornice ridges. All this makes for very spectacular and scenic climbing. Unfortunately, changing conditions on the route have kept us from attempting it in recent years, although things might be trending toward the better. 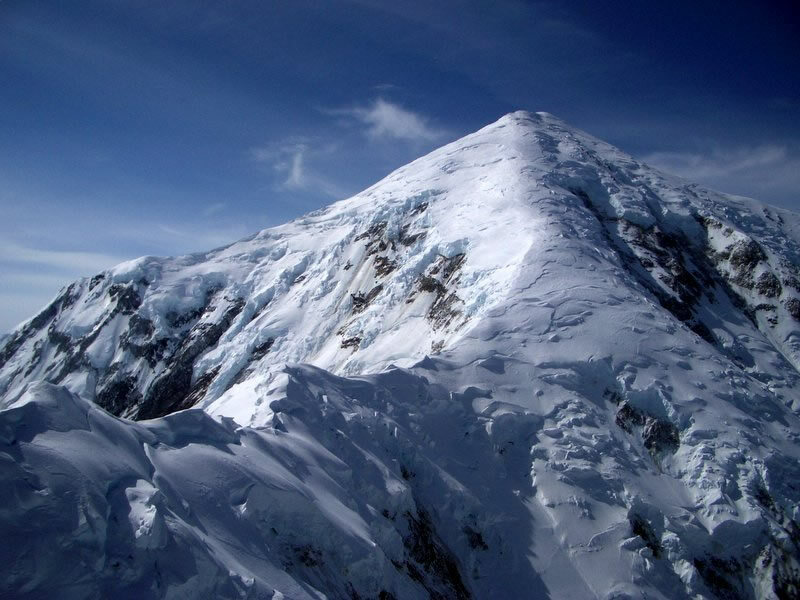 In the spring of 1996 we began leading climbers up the most popular line on Mount Foraker, the Sultana or Northeast Ridge. It is a longer route than the Southeast Ridge but harbors less objective hazards. This is a challenging route with a big summit day that demands respect. We fly into the Southeast fork of the Kahiltna Glacier and set forth across the Kahiltna proper to make our base camp at the base of 12,800’ Mount Crossen. 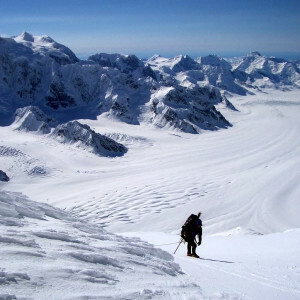 A steep entrance gulley leads to a snowy ridge that climbs to a dramatic camp perched high above the Kahiltna Glacier. Above this camp, steeper steps of snow and ice are encountered as we climb up and over Mount Crossen to make Camp 2. 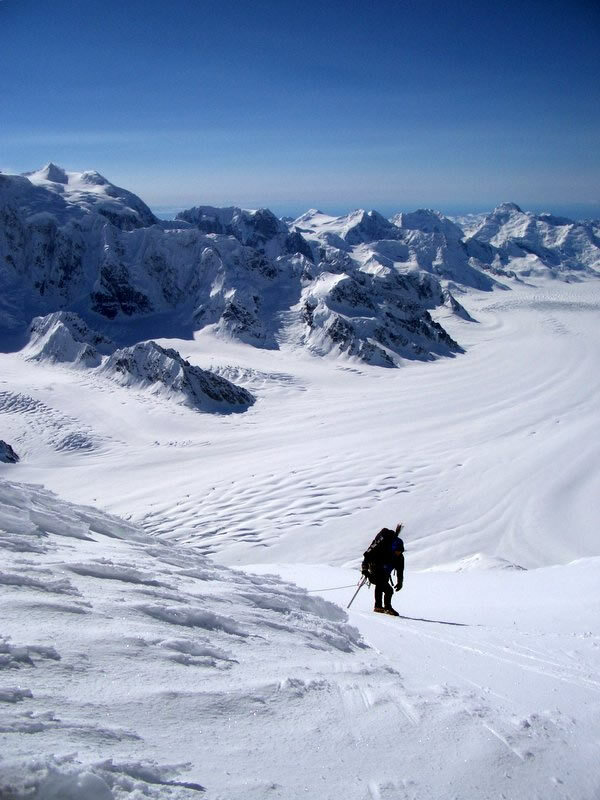 The long ridge line that connects Crossen with Mount Foraker presents climbers with a mix of steep steps, wild cornices and knife-edged ridges. 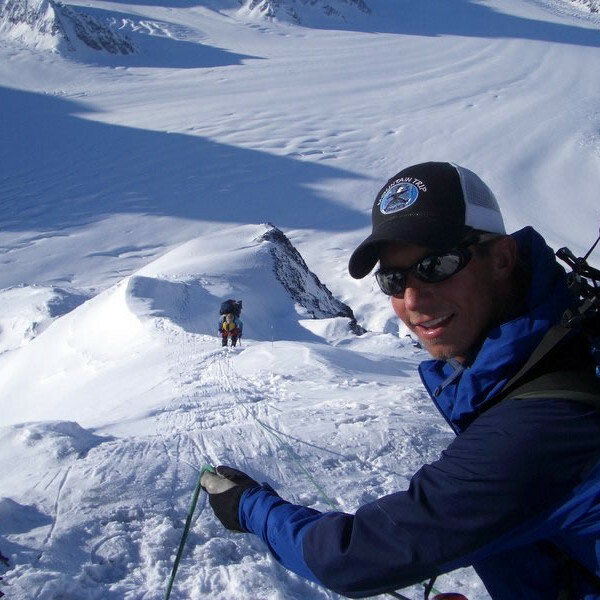 Summit day is a physically challenging ascent of the sublime Northeast Ridge, negotiating crevasses and continuously steep cramponing. This route should only be considered by very fit climbers with solid crampon and ice axe technique. DAY 1: MEET IN ANCHORAGE. We will conduct a Team Meeting at 10 A.M. for an expedition orientation and equipment check. This is a very important meeting, which you must attend. Be sure to arrive in Anchorage early enough to make the meeting; which may require arriving a day early. Our trip fee includes two nights accommodation at the Millennium Alaska Hotel, which is conveniently located and offers free airport transfers. DAY 2: TRAVEL TO TALKEETNA AND FLY TO THE GLACIER. Team members will travel by shuttle the several hours to Talkeetna. Everyone will need to register with the National Park Service prior to flying to the glacier. Weather permitting; we will fly into the Kahiltna Glacier at 7,200 feet that afternoon. 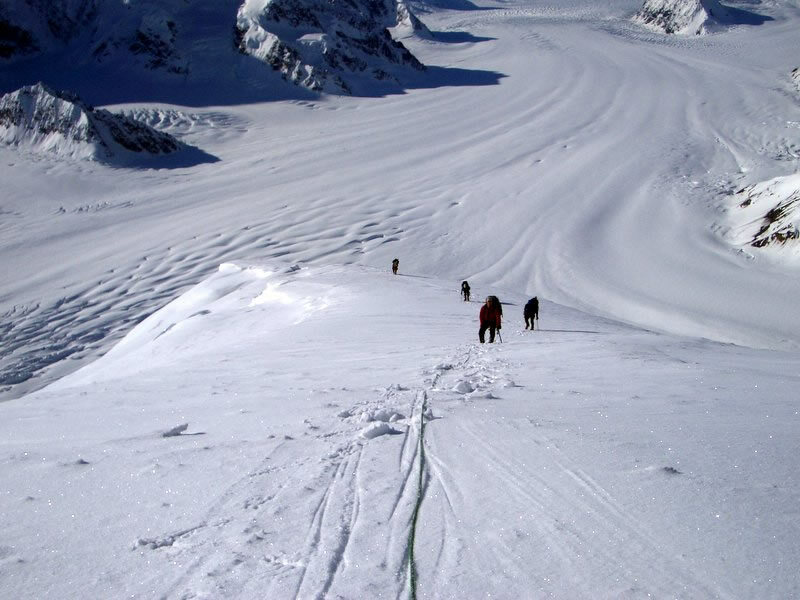 Once on the glacier, everyone will need to pitch in to get Base Camp established so we can proceed with our on-glacier expedition orientation that will cover the following topics: glacier travel, crevasse rescue, sled rigging, rope management and camp site procedures. DAY 3: MOVE TO ADVANCED BASE CAMP. Departing base camp, we’ll drop down the infamous Heartbreak Hill and onto the broad Kahiltna glacier. Our goal will be to move all of our equipment and supplies across the glacier. 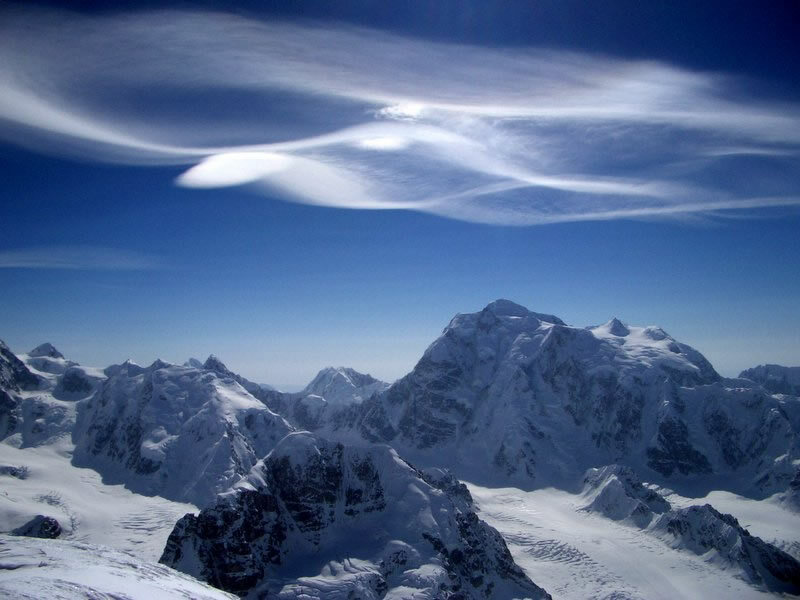 We’ll set up an ABC near the base of Mount Crosson, just north and east of Foraker, at an elevation of about 6,700′. DAY 4: CARRY LOADS UP TO CAMP 1 ON MT CROSSON. 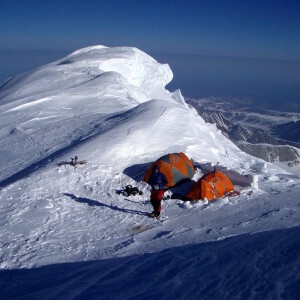 Moderately steep climbing leads to a spectacular camp above a prominent gendarme at about 10,000′. DAY 5: MOVE CAMP TO “CROSSON CAMP.” It is possible to single carry up to this camp, if a team is acclimatized and strong, but generally, we break this move into two days. DAY 6: MOVE CAMP OVER MT CROSSON. 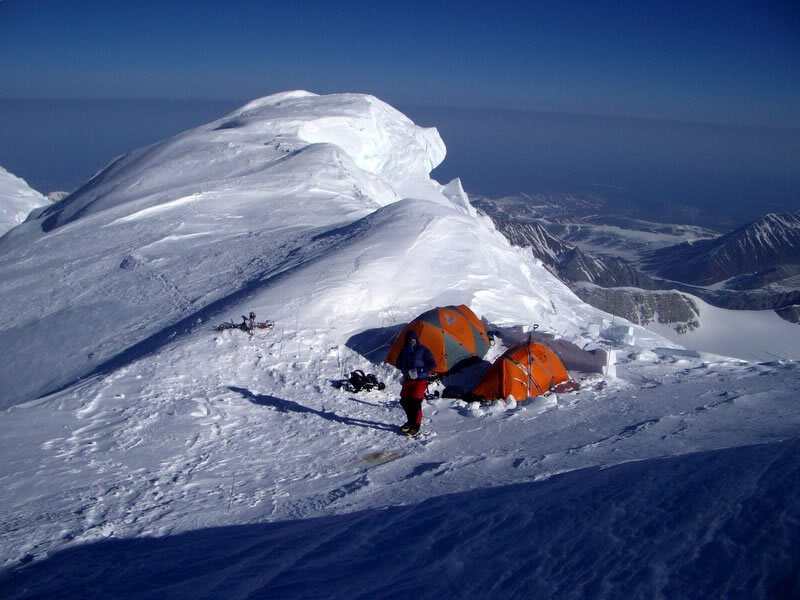 Our second camp is often between Mt Crosson and Peak 12,472. We have a lot of options as to where we will put this camp, but they are all somewhere above 11,000′. DAY 7: CARRY ACROSS THE INTERCONNECTING RIDGE TO THE BASE OF THE SULTANA RIDGE. The distance of travel is not too great, but the terrain can be challenging, so this is a fairly long, challenging day. DAY 8: MOVE TO HIGH CAMP AT THE BASE OF THE SULTANA. We have options for how and where to place our high camp. 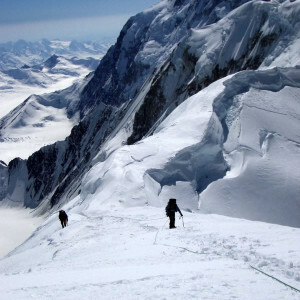 Most parties opt to climb the entire Sultana Ridge as their summit day, but it is possible to place a camp on the ridge proper, at about 14,000′. This decision will be made based on a variety of factors, including weather, conditions, team strength and health, etc. DAY 10: SUMMIT DAY. Summit day is a monster. We’ll climb almost a vertical mile of 40 degree terrain. We need to have a really good day in order to make it up and down, so we will be highly selective about our decision making. Summit climbers must have demonstrated a high degree of fitness and technical proficiency, as this day will demand a lot of everyone. DAY 11: DESCENT – PART 1. The descent from high camp on the Sultana is challenging and takes some time. 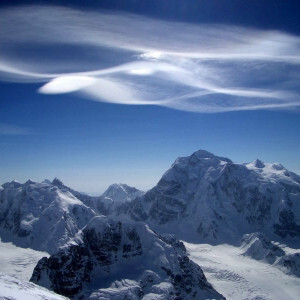 In general, we will try to reach Mt Crosson on the first day of our descent. DAY 12: DESCENT – DAY 2. From our camp near the top of Crosson, we’ll drop down to the Kahiltna, clean our cache from our ABC, and trek across the glacier to the airstrip. DAY 13: FLY OFF THE GLACIER. Weather permitting, we’ll be in Talkeetna for breakfast! DAY 14 – 21: CONTINGENCY DAYS. 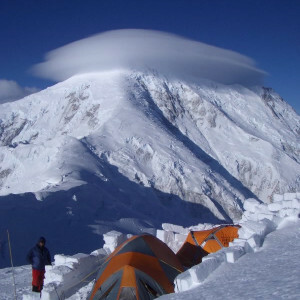 The following is a general list of required gear for climbing Mount Foraker with Mountain Trip. Climbers joining us on an expedition will receive an updated, comprehensive equipment list that may supersede this list. Many of the items on the list need to fit you well in order for you to fully enjoy your experience on the mountain. Please plan ahead with equipment purchased for your trip so you can be certain that your gear fits you well. Cresting the summit of Mt Crosson, en route to the Sultana, is not the place to discover that your pack is too small for your torso, or that your boots give you blisters. Recommended items reflect the opinions of our guides. We have used and have faith in all of our recommendations, but they may not necessarily fit or work for you. Call or email us with any gear questions. We want you to be as prepared as possible for your expedition. Please follow this list closely and do not hesitate to call us for clarifications or to solicit an opinion about anything you are considering. There is a good selection of gear available in Anchorage, but please plan ahead for things that you might need in a particular size, as local shops do not always have every item in stock. Lastly, only bring quality gear that is in very good condition on your expedition. Mountaineering Socks 3 - 5 pairs of good wool socks. Try a couple of different weights as that will affect the fit of your boot. Mountaineering Boots Modern Mountaineering Boots fall into two categories, traditional double boots and the newer triple boot systems with integrated gaiters. Either variety works well, however the “triple boots” are lighter and arguably simpler. Whichever you decide to use, the goal is to have warm, comfortable feet! Try on a variety of boots as they all fit differently and get the one that fits well. Consider your future mountaineering objectives when purchasing boots as well. Remember "double" boots require overboots! With "triple" boots it is all built in. Gaiters Gaiters are required unless your pants fit tightly around your boot, many boots have built in gaiters. Expedition Parka This is an important layer so don't skimp! You do not need the heaviest 8000meter parka for peaks like Denali and Aconcagua, but you should have a warm, baffled parka with a hood. Light Fleece Hoody Light/mid weight fleece (or wool) top with a hood. You will wear this over your light weight base layer. Hard Shell Jacket This jacket should be large enough to go over your light puffy jacket layer. You do not need the burliest/heaviest Gore-Tex jacket you can find, and we prefer the lightest weight versions. Soft Shell Wind Jacket Many high alpine peaks are cold and dry. We are huge fans of very lightweight softshell wind jackets for high, dry, cold peaks. Weighing just a few ounces, these can be carried in your pocket or in the lid of your pack for rapid deployment. This layer is used in addition to your more waterproof hard shell jacket. Vest (optional) A lightweight down or synthetic filled vest can be a nice addition and add some warmth with little weight. This is an optional layer for most climbers. Base Layer Bottoms (1 or 2 sets) of Wool or Capilene light weight base layers. Light Fleece Bottoms As the air thins and the wind picks up, you'll want a bit more insulation on your legs. This should be a slightly warmer layer that can go over your base layer bottoms when it gets cold. Hard Shell, Waterproof Pants When it's raining a soft shell pant just isn't enough and you'll need a waterproof "hard shell" pant, Gore-Tex or equivalent. These should be as light weight as possible, fully separating side zippers will help to get them on without taking off your boots. On some peaks, you might carry hard shell pants for the lower mountain, but switch to soft shell pants for the colder and drier upper mountain. Puffy Insulated Expedition Pants On summit day or on a cold morning, you will need a warm layer that can go over your baselayers and softshell pants. This layer should be down or synthetic (ie. Primaloft) filled and must have fully separating side zippers. Practice putting these puffy pants on and taking them off while wearing your boots before you leave for your expedition. Heavyweight Gloves Warm, insulated gloves are the day-to-day workhorses on cold peaks or for cold days of ice climbing. We prefer gloves with removable liners for ease of drying. Medium Weight Gloves A Mid-weight glove will generally be a softshell type glove with some light synthetic insulation. Summit Mittens Thick, warm mittens made from Down, synthetic fill, or a combination of insulation are crucial for summit morning on many big, cold mountains. Most come with some form of retention straps, which can help reduce the chance of losing them to a gust of wind or in the event of a fall. Good mittens are expensive, but how much is one finger worth? Face Mask Cheeks and the tip of your nose are notoriously difficult to keep warm, especially in a biting wind. Neoprene face masks do a great job of protecting those exposed surfaces. Hand Warmers Bring 4 -6+ sets of these disposable insurance policies, depending on where you are climbing. Make certain that your hand warmers are relatively new, as they do go bad over time. Glacier Glasses Good, dark (Category 4) glacier glasses are a must for high altitude climbs. They must have side protection and filter 100% UVA and UVB rays. Ski Goggles These are necessary for use while traveling during storms or during really cold spells. These must have double lenses and provide full UV protection. Fogging is a real challenge, so the “Turbo Fan” goggles are worth the investment! Select a general purpose lens that will provide some protection in bright light, but not be so dark as to make them useless on a cloudy or flat-light day. Nose Guard Beko makes nice nose protectors that keep the wind and sun from wreaking havoc on your skin. Foam Sleeping Pad Bringing two sleeping pads, one closed cell foam and the other an inflatable pad, will provide additional comfort and insulation, as well as a bit of insurance in case you have a catastrophic failure of your inflatable pad. Compression Stuff Sack Granite Gear, Outdoor Research and others are all making nice, lightweight compression sacks. These are essential for sleeping bags and recommended for your summit clothes, such as your parka, mitts and warmest pants, so you might consider bringing two. Ski / Trekking Poles Adjustable poles work great and are easier to travel with as they fit better in your duffel bag. The small “trekking” baskets on some poles are not large enough for use on soft snow, so make certain your poles have bigger “snowflake” style baskets for any climb with glacier or snow travel. Ice Axe A general use, mountaineering axe is sufficient for this climb. Some axes are much lighter than others, so select for weight as well as a size for your height. Most climbers do well with a 60 - 75 cm axe. On less technical routes, a longer axe can act like a walking stick on flatter terrain. Alpine Climbing Harness Your harness should be adjustable enough to accommodate several layers of clothing. As with most items on this list, choose a light weight harness. Carabiners Bring eight regular (non-locking) carabiners. Please do not bring “bent-gate” carabiners, as these have certain limitations that do not make them appropriate for how we will use them. Mark your 'biners with colored tape for identification. Locking Carabiners Bring three locking carabiners. Screwgate or auto-locking 'biners work equally well, although the new magnetic gate versions seem like they might be less prone to freezing closed. Select light weight carabiners. Accessory/Prussik Cord 50 feet (15.25m) of 6mm accessory cord will be used to create a prussik, rig your ascender, and extra for setting up your sled for glacier travel. We will go over this in our pre-trip training. Climbing Helmet Make certain it fits over your warmest hat and under the hood of your shell. The super-lightweight foam helmets are great, but can get crushed in your duffel bags during travel, so protect your lid! Crampons Select a pair 12-point Mountaineering Crampons that fit your boots well. Step-in or strap versions work equally well; just make sure they fit your mountain boots and overboots. You may need to lengthen your crampons to accommodate your overboots, please make sure you can make this adjustment in the field. Aluminum crampons are not acceptable for expeditions. Primary Attachment Locking Carabiner For your primary attachment to the rope, we will us a "triple action" locking carabiner. Triple Action (TriAct) carabiners will not come unlocked while you are traveling on the glacier. You only need one of these carabiners. Double Length Runner (48″) Double Length (48") runner. Nylon runners are pretty versatile and utilitarian. For glacier trips they can be used as a chest harness. For technical climbs (Carstensz Pyramid, rock climbing trips in Colorado) please bring 2. Insulated Bottle Cover(s) Water bottles freeze when it gets cold. Crazy, but true! Extra clothing can help insulate bottles, but dedicated water bottle insulators do a much better job. Bring at least one. Lip Balm (2 tubes) Protect your lips! Bring two tubes of high quality lip balm with SPF. Sun Screen Smaller tubes work well, as they are easier to keep from freezing than is one big tube. You'll want to bring 3-4 ounces (85 - 110g) for the trip. P-Bottle Wide-mouth, collapsible Nalgene Cantenes work great- they make a 96 ounce version, which will come in handy during long storms or if you take Diamox. Ladies- look for an appropriate adapter available at your local outdoors store. These items can both be tough to find in Anchorage so plan ahead! Toilet Paper Depending on your technique, you'll want 1-2 rolls, each packed in a quality zip-lock bag. Personal Medical Kit Mountain Trip's guides will have fairly comprehensive medical kits developed by our Medical Director, but we encourage each climber to bring a small, personal kit. Items to consider bringing include: blister treatment and prevention, pain relievers, and antacids. Presctiption medications should be based on consultation with your personal physician. 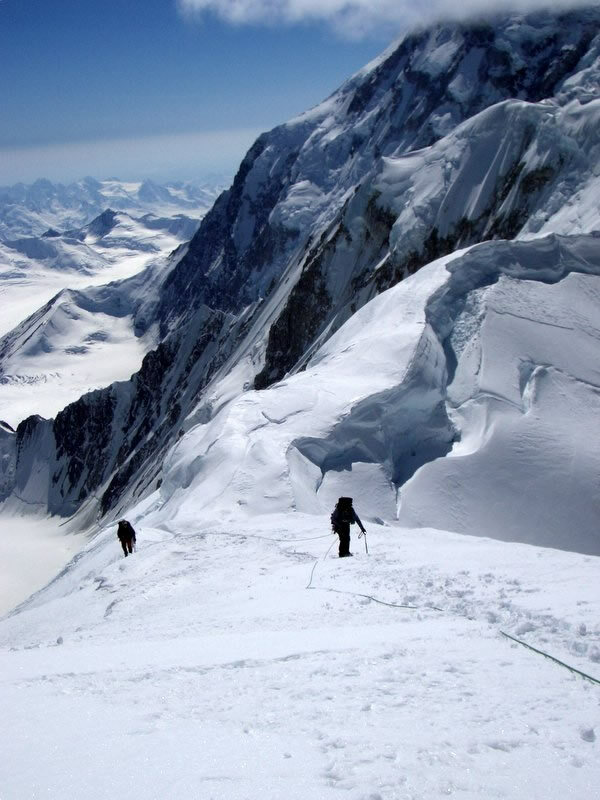 Suggested drugs for altitude expeditions include: Diamox (acetazolomide) 125 mg, Decadron (dexamthazone) 4 mg, Nifedipine XR 30 mg, and a couple of antibiotics for respiratory and gastrointestinal issues. Journal (and pencil) Expeditions can be a great time for reflection and a journal can be a nice way to wax poetic or just keep track of what you did each day. Keep it small and leave the leather bound version at home. Book(s) or E-Reader There is a lot of "down time" on an expedition, even when you have good weather. An expedition can be a good time to catch up on reading! Altimeter Watch An altimeter watch can be fun to have on an expedition to keep track of your ascent and to watch for changes in barometric pressure. Maps Our guides will have maps and/or GPS devices, but a good map can be fun to have along. Lighter Your guides will have plenty of lighters, but it is nice to have one lighter per tent, as cord always needs to be cut and melted. Small Knife A small knife or small multi-tool is also handy to have. One per tent is sufficient. There is emphasis on the word small when it comes to multi-tools! Satellite Tracking/Texting Device Satellite linked devices such as the Garmin inReach have been increasingly popular, as you can send and receive text messages with it. Again- consider how you will keep it powered over the course of your expedition. These new devices will allow you to send and receive text messages nearly anywhere in the world! It is a fun way to keep in touch with the family and let them follow along on your journey. They are not required, and Mountain Trip guides carry several forms of communication devices including satellite based communications that we can use in case of an emergency situation. [post_excerpt] => 3 - 5 pairs of good wool socks. Try a couple of different weights as that will affect the fit of your boot. [post_excerpt] => Gaiters are required unless your pants fit tightly around your boot, many boots have built in gaiters. [post_excerpt] => This is an important layer so don't skimp! You do not need the heaviest 8000meter parka for peaks like Denali and Aconcagua, but you should have a warm, baffled parka with a hood. [post_excerpt] => Light/mid weight fleece (or wool) top with a hood. You will wear this over your light weight base layer. [post_excerpt] => This jacket should be large enough to go over your light puffy jacket layer. You do not need the burliest/heaviest Gore-Tex jacket you can find, and we prefer the lightest weight versions. [post_excerpt] => Many high alpine peaks are cold and dry. We are huge fans of very lightweight softshell wind jackets for high, dry, cold peaks. Weighing just a few ounces, these can be carried in your pocket or in the lid of your pack for rapid deployment. This layer is used in addition to your more waterproof hard shell jacket. [post_excerpt] => A lightweight down or synthetic filled vest can be a nice addition and add some warmth with little weight. This is an optional layer for most climbers. [post_excerpt] => (1 or 2 sets) of Wool or Capilene light weight base layers. [post_excerpt] => As the air thins and the wind picks up, you'll want a bit more insulation on your legs. This should be a slightly warmer layer that can go over your base layer bottoms when it gets cold. [post_excerpt] => When it's raining a soft shell pant just isn't enough and you'll need a waterproof "hard shell" pant, Gore-Tex or equivalent. These should be as light weight as possible, fully separating side zippers will help to get them on without taking off your boots. On some peaks, you might carry hard shell pants for the lower mountain, but switch to soft shell pants for the colder and drier upper mountain. [post_excerpt] => On summit day or on a cold morning, you will need a warm layer that can go over your baselayers and softshell pants. This layer should be down or synthetic (ie. Primaloft) filled and must have fully separating side zippers. Practice putting these puffy pants on and taking them off while wearing your boots before you leave for your expedition. [post_excerpt] => Warm, insulated gloves are the day-to-day workhorses on cold peaks or for cold days of ice climbing. We prefer gloves with removable liners for ease of drying. [post_excerpt] => A Mid-weight glove will generally be a softshell type glove with some light synthetic insulation. [post_excerpt] => Thick, warm mittens made from Down, synthetic fill, or a combination of insulation are crucial for summit morning on many big, cold mountains. Most come with some form of retention straps, which can help reduce the chance of losing them to a gust of wind or in the event of a fall. Good mittens are expensive, but how much is one finger worth? [post_excerpt] => Cheeks and the tip of your nose are notoriously difficult to keep warm, especially in a biting wind. Neoprene face masks do a great job of protecting those exposed surfaces. [post_excerpt] => Bring 4 -6+ sets of these disposable insurance policies, depending on where you are climbing. Make certain that your hand warmers are relatively new, as they do go bad over time. [post_excerpt] => Good, dark (Category 4) glacier glasses are a must for high altitude climbs. They must have side protection and filter 100% UVA and UVB rays. [post_excerpt] => These are necessary for use while traveling during storms or during really cold spells. These must have double lenses and provide full UV protection. Fogging is a real challenge, so the “Turbo Fan” goggles are worth the investment! Select a general purpose lens that will provide some protection in bright light, but not be so dark as to make them useless on a cloudy or flat-light day. [post_excerpt] => Beko makes nice nose protectors that keep the wind and sun from wreaking havoc on your skin. [post_excerpt] => Bringing two sleeping pads, one closed cell foam and the other an inflatable pad, will provide additional comfort and insulation, as well as a bit of insurance in case you have a catastrophic failure of your inflatable pad. [post_excerpt] => Adjustable poles work great and are easier to travel with as they fit better in your duffel bag. The small “trekking” baskets on some poles are not large enough for use on soft snow, so make certain your poles have bigger “snowflake” style baskets for any climb with glacier or snow travel. [post_excerpt] => A general use, mountaineering axe is sufficient for this climb. Some axes are much lighter than others, so select for weight as well as a size for your height. Most climbers do well with a 60 - 75 cm axe. On less technical routes, a longer axe can act like a walking stick on flatter terrain. [post_excerpt] => Your harness should be adjustable enough to accommodate several layers of clothing. As with most items on this list, choose a light weight harness. [post_excerpt] => Bring eight regular (non-locking) carabiners. Please do not bring “bent-gate” carabiners, as these have certain limitations that do not make them appropriate for how we will use them. Mark your 'biners with colored tape for identification. [post_excerpt] => Bring three locking carabiners. Screwgate or auto-locking 'biners work equally well, although the new magnetic gate versions seem like they might be less prone to freezing closed. Select light weight carabiners. [post_excerpt] => 50 feet (15.25m) of 6mm accessory cord will be used to create a prussik, rig your ascender, and extra for setting up your sled for glacier travel. We will go over this in our pre-trip training. [post_excerpt] => Make certain it fits over your warmest hat and under the hood of your shell. The super-lightweight foam helmets are great, but can get crushed in your duffel bags during travel, so protect your lid! [post_excerpt] => Select a pair  12-point Mountaineering Crampons that fit your boots well. Step-in or strap versions work equally well; just make sure they fit your mountain boots and overboots. You may need to lengthen your crampons to accommodate your overboots, please make sure you can make this adjustment in the field. Aluminum crampons are not acceptable for expeditions. [post_excerpt] => Double Length (48") runner. Nylon runners are pretty versatile and utilitarian. For glacier trips they can be used as a chest harness. For technical climbs (Carstensz Pyramid, rock climbing trips in Colorado) please bring 2. [post_excerpt] => Water bottles freeze when it gets cold. Crazy, but true! Extra clothing can help insulate bottles, but dedicated water bottle insulators do a much better job. Bring at least one. [post_excerpt] => Protect your lips! Bring two tubes of high quality lip balm with SPF. [post_excerpt] => Smaller tubes work well, as they are easier to keep from freezing than is one big tube. You'll want to bring 3-4 ounces (85 - 110g) for the trip. [post_excerpt] => Wide-mouth, collapsible Nalgene Cantenes work great- they make a 96 ounce version, which will come in handy during long storms or if you take Diamox. Ladies- look for an appropriate adapter available at your local outdoors store. These items can both be tough to find in Anchorage so plan ahead! [post_excerpt] => Depending on your technique, you'll want 1-2 rolls, each packed in a quality zip-lock bag. [post_excerpt] => Mountain Trip's guides will have fairly comprehensive medical kits developed by our Medical Director, but we encourage each climber to bring a small, personal kit. Items to consider bringing include: blister treatment and prevention, pain relievers, and antacids. Presctiption medications should be based on consultation with your personal physician. 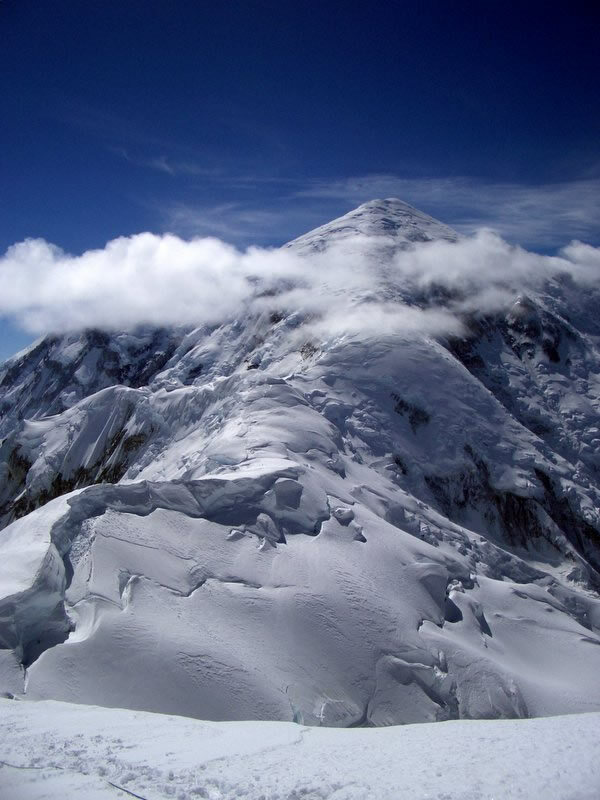 Suggested drugs for altitude expeditions include:  Diamox (acetazolomide) 125 mg, Decadron (dexamthazone) 4 mg, Nifedipine XR 30 mg, and a couple of antibiotics for respiratory and gastrointestinal issues. [post_excerpt] => Expeditions can be a great time for reflection and a journal can be a nice way to wax poetic or just keep track of what you did each day. Keep it small and leave the leather bound version at home. [post_excerpt] => There is a lot of "down time" on an expedition, even when you have good weather. An expedition can be a good time to catch up on reading! [post_excerpt] => An altimeter watch can be fun to have on an expedition to keep track of your ascent and to watch for changes in barometric pressure. [post_excerpt] => Our guides will have maps and/or GPS devices, but a good map can be fun to have along. [post_excerpt] => Your guides will have plenty of lighters, but it is nice to have one lighter per tent, as cord always needs to be cut and melted. [post_excerpt] => A small knife or small multi-tool is also handy to have. One per tent is sufficient. There is emphasis on the word small when it comes to multi-tools! [post_excerpt] => Satellite linked devices such as the Garmin inReach have been increasingly popular, as you can send and receive text messages with it. Again- consider how you will keep it powered over the course of your expedition. These new devices will allow you to send and receive text messages nearly anywhere in the world! It is a fun way to keep in touch with the family and let them follow along on your journey. They are not required, and Mountain Trip guides carry several forms of communication devices including satellite based communications that we can use in case of an emergency situation. 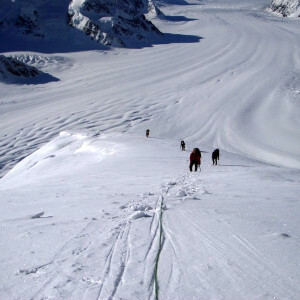 Mountain Trip recognizes how difficult and disappointing it can be for climbers who must cancel expeditions which they have planned for a long time. Team members must also recognize that, due to the nature of planning expeditions and dealing with governmental permits and regulations, Mountain Trip also accrues significant expenses in the months prior to expedition departure dates. We must therefore adhere to a strict refund policy for all climbers. Trip cancellation and travel insurance is generally available for all expeditions. U.S. and Canadian residents should contact us for more information regarding travel insurance. Our refund and cancellation policy is outlined below. • All Foraker expeditions require a $1500 deposit to secure a spot on the team. Your submission of a deposit constitutes your acceptance of this Fee Schedule, Refund and Cancellation Policy. • All deposits for Foraker expeditions include a non-refundable $750 administration fee. • Final payments for expeditions must be received 120 days prior to the Team Meeting Day. • Failure to pay expedition fees by the date they are due constitutes cancellation of your spot on the team and forfeiture of your deposit. • Any cancellation 120+ days before your Team Meeting Day will be refunded in full, less the administration fee. • If you cancel 120-90 days before your Team Meeting Day, you are eligible for a refund of 50% of any monies paid, less the deposit. • No refunds will be provided for cancellations occurring within the last 89 days prior to an expedition. • If you register for a climb within 90 days of the Team Meeting Day, expedition fees will be due in full to secure your spot on the team. • Mountain Trip reserves the right to cancel an expedition prior to the departure date for any reason. In such an event, all monies collected by Mountain Trip from team members for that expedition shall be promptly refunded. This is the extent of our financial liability. • Lodging in Alaska, although we can help you secure rooms in Anchorage at a negotiated rate – please inquire about this option. • Mountaineering Cost Recovery Fee ($260 for climbers 24 years old and younger, $360 for older climbers) paid to the National Park Service at the time you register for your individual climbing permit. When registering for an expedition with Mountain Trip we want to help make sure you understand the services we are providing and the services you are responsible for. The main purpose of becoming a team member is to join us on an expedition in the mountains. As such any transportation we provide or that you may contract for on your own is incidental to the trip. We suggest that you make sure you have time built into your itinerary for delays. We will designate a specific Team Meeting Day for your expedition. Transportation to the meeting point on your Team Meeting Day is to be provided by you. You must arrive in time to be ready to participate in a team meeting at the appointed time on the Team Meeting Day for your expedition. This probably means you will need to arrive the day before, as our Team Meetings for Alaska trips are held in the morning. Expedition climbing is very dynamic and we will provide you with a recommendation as to when you should book your flights to and from your destination. We suggest you book a ticket that allows you to change your flight with little effort or cost. You are ultimately responsible for your own well-being, including making all necessary preparations to ensure good health and physical conditioning. You are responsible for understanding the conditions that may exist on the climb and choosing a climb that is appropriate for your abilities and interests. You are responsible for having knowledge of all pre-departure information and for assembling the appropriate clothing and equipment for your climb. While on the expedition, team members are responsible to maintain basic levels of hygiene and to conduct themselves respectfully with other team members and members of the local population. If a guide feels that a team member is putting other members’ health or safety at risk, the guide has the discretion to remove a team member from an expedition. Use our office staff and your lead guide as pre-trip resources to ensure that all your questions are answered. Travel insurance may help recoup expenses if you need to leave an expedition due to an illness. Airline Responsibility Passenger/Airline contracts are in effect while team members are on board any aircraft contracted for use in the expedition. While it is one of our goals to help every climber on every Mountain Trip expedition reach the summit, Mountain Trip cannot guarantee that you will reach the summit. Any number of factors, including weather, the conditions encountered on the route, your personal level of fitness or ability, the abilities of your team mate(s) or any number of other circumstances might result in you and/or your team turning around before reaching the summit. 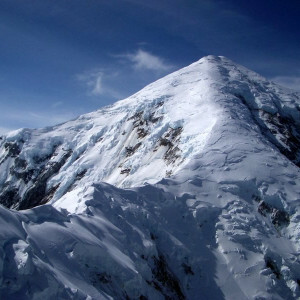 Failure to reach the summit due to any reason associated with mountaineering, such as weather, team dynamics, route conditions, avalanche hazard, rockfall hazard, etc, or due to your lack of fitness or preparation are not the responsibility of Mountain Trip and will not result in a refund or a rescheduling of your expedition. 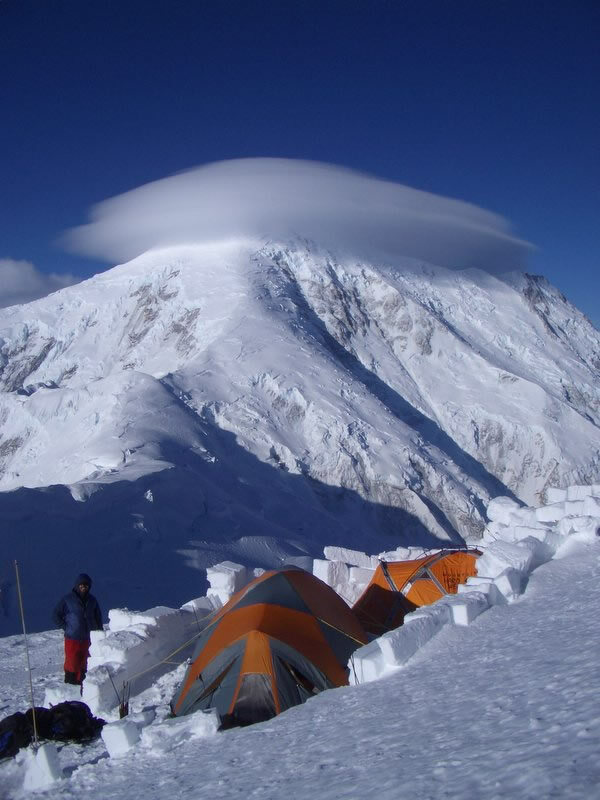 If you have any additional questions or would like to book a Mount Foraker mountaineering trip, give us a call at +1-970-369-1153 or send us a note. Spent the day with Clint Cook climbing, learning how to build anchors, and refreshing some skills. Felt safe the whole time and learned a bunch. Thanks! My wife and I were in Telluride and decided to do the Via Ferrata. It was a great time and we really enjoyed it. Our guide Jesse was awesome! His number one priority was our safety. All the staff were really friendly and helpful. I definitely recommend this trip and this company. The whole trip was wonderful, it was a great experience and also the staff was super friendly and very safe. Would definitely recommend! Everyone at Mountain Trip was amazing to work with! They were encouraging, professional, personal – just incredible!! Our guide was Kristin, and she was outstanding!!!! Exceptional company for such an incredible experience!! Booked this adventure a week before we arrived in Telluride – wasn’t sure what to expect but it was absolutely amazing. As adventure travellers (we were passing through Telluride enroute to Jackson Hole, WY to summit Grand Teton) we can be hard to impress – but the Via Ferrata route and equally as important, our guides from Mountain Trip did not disappoint. I did this with my 12 year old son and our guide was very tuned in to his age / unique needs (he was the only kid in our group). I think there are other Via Ferrata guides in the area but I can’t imagine them being better than Mountain Trip. The staff, reservation and guidance was awesome. My guide Kristin Arnold was phenomenal! Absolutely love the hike and her expertise made it so much more memorable. I’ll be back and will definitely tell my friends! Mountain trip is the best!